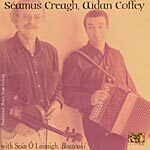 Seamus Creagh, of Daly and Creagh (1977) fame, has found another worthy accomplice in Aidan Coffey, the Waterford accordion player previously with De Dannan. As the two musicians have adopted Cork as their new home, it is hardly surprising that their repertoire includes quite a few of the polkas and slides native to the southwest. But Creagh and Coffey are equally at ease with the more standard jigs and reels, including an epic set of the two versions of "The Gold Ring." Throughout, O'Loinsigh provides understated accompaniments on Greek bouzouki, in the manner of De Dannan's Alec Finn. Lovely stuff.